Trying not to go crazy with beauty products on my trip, i was pleased that i only picked up these bits. Since i feel like i have a ton of makeup i have yet to test and try so i didn't feel the need to go crazy for cosmetics. 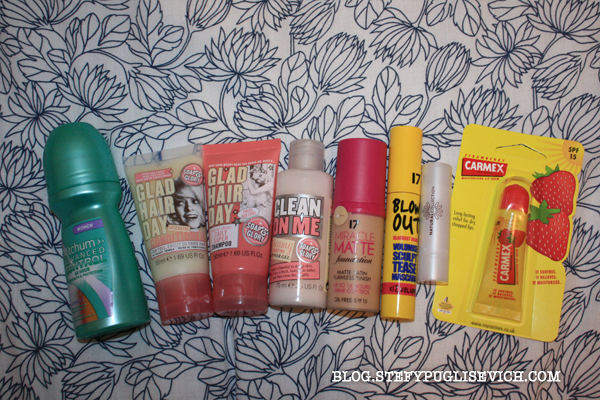 Soap & Glory have been on my wishlist for so long i decided to pick up a few travel sized products to try and reviews have been up on my blog so you can check them out. 17 products were on offer at boots where you purchase 2 for just £8 so i picked up foundation & mascara. A carmex lip balm and a natural collection lipstick in the color rose bud. Stay tuned for all other reviews for the rest of products, these will be put up once i have tried & tested them.